The Bank of England is worried, very worried, because for the past 4 years Britain's central bank has been busy battling to prevent financial armageddon from taking place by means of stuffing every orifice of the too big to fail banks with free money courtesy of the electronic money printing presses to the tune of £375 billion to date, the consequences of which is that everyone in Britain pays the price in terms of high inflation that money printing brings to ever escalating degree as countless historic examples such as Weimar Germany and Zimbabwe illustrate where this trend ultimately leads. Against the desperate effort to save the financial system, all of Britain's biggest banks have been determined to destroy the financial system as a consequence of the bonus system that encourages employees to bank bonuses on the basis of fictitious profits conjured out of thin air by shuffling around trillions of derivatives exposure on and off the bank balance sheets. The ongoing LIBOR scandal gives one small glimpse under the hood of the cesspit that goes by the name of Barclays Bank, with probably ALL of Britain's big banks to result in similar LIBOR manipulation scandal revelations as the mainstream press plays catchup to what in effect is a 4 year old story as I touched open several aspects of during the past few weeks. Tax payers have been repeatedly forced to recapitalize the bankrupt British banks starting with Northern Rock, and each time politicians promise that this is the last time and that the tax payers will ultimately break even. However the LIBOR scandal virtually guarantees huge damages and fines could be levied on Barclays and the rest of the market manipulators that have huge exposure to the interest rate derivatives markets that runs into the tens of TRILLIONS! At this point one can only speculate on how high the damages could go but the eventual settlements could make the tax payer bailouts to date look like peanuts. Once upon a time the £2 billion first bailout of Northern Rock seemed like an enormous amount of money, a similar amount today would not even register in the press. Then it was the tens of billions for the likes of RBS, and LLoyds, and it increasingly looks like the fools in Whitehall will put British taxpayers on the hook for literally hundreds of billions more. Lawyers from all over the world are circling like vultures over the carcass of the bankrupt Canary Wharf banks preparing to exact a high price from our LIBOR manipulating banks that effectively wipes out several times over the few tens of billions of economic austerity savings that the Coalition government claims as its greatest achievement of the past 2 years. 01 Jul 2012 - If Bank of England Approved LIBOR Rate Manipulation, Will Mervyn King Resign? 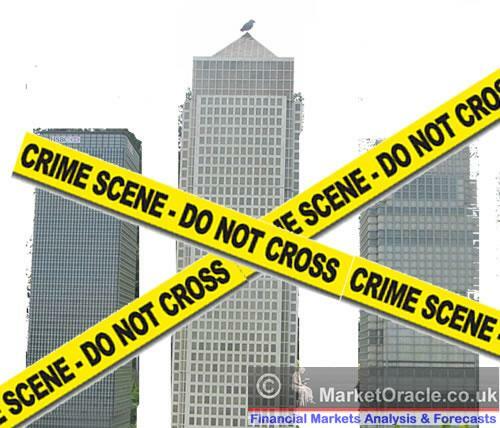 Libor scandal latest is that the SFO will now investigate and that the UK politicians have attempted to duck the issue by avoiding a public inquiry that would have implicated members of both major political parties. I took my cue way back in October 2011 (23 Oct 2011 - Savers Protect Your Deposits From Bankrupting Banks and Quantitative Inflation) to start moving my funds firstly out of the big UK banks as a consequence of the ever increasing risk of financial armageddon that these banks were hell bent on inflicting onto the British economy, and then from the rampant exponential inflation consequences of Government and Bank of England response towards the continuing prevention of financial Armageddon by means of printing debt and money. The mainstream press as illustrated by the BBC has been busy lately reporting that over half a million people have also concluded that the time has come to abandon Britains biggest banks by drawing their funds out and depositing with more ethical, mutual's or local banks such as the Co-op and the Nationwide. If you have not already done so then you need to both protect your savings from crooked big banks before it gets permanently frozen RBS style or worse, and do your part in decreasing the size of these so called too big to fail banks by re-allocating your savings elsewhere. It won't be long before the mainstream press will start reporting on customer black listing of big UK banks due to the stomach churning feeling they get each time they step across the thresholds at the likes of RBS and Barclays, as existing customers wait in the queue to be called to fraudster number 3, I mean cashier number 3 as one wonders what will be the next big bankster fiddle perpetuated on customers to be revealed, following the likes of PPI mis-selling, or even more recent news of worthless interest rate hedges that crippled and bankrupted many small businesses. The only solution to Britain's banking crisis is to dismantle the system of fractional reserve banking that has allowed the banks to gamble on leverage. Once banks are stopped from gambling on derivatives then they will be forced to rely on making loans to businesses and individuals funded by depositors to generate profits. This would greatly shrink the size of the banks and promote competition between banks for both depositors and borrowers. Off course the Government is not going to go down this route as I next explain why. Ultimately the slow motion run on the big banks and the legal costs and damages awarded for LIBOR manipulation will be met by more tax payer bailouts because the big banks and their ability to gamble on leverage with trillions of exposure on the derivatives markets are a fundamental part of the system of printing money to monetize UK government debt. Britain's political / economic system functions by means of government politicians relying on the Bank of England to print debt / money to finance the huge annual budget deficits (£130 billion per year) rather than raise taxes so as the party in power buys votes to attempt to stay in power, to achieve this the Bank of England encourages the banks with cheap money (QE - buys government bonds and other assets from the banks), fractional reserve banking leverage and capital requirements to generate demand and a liquid market for government debt with the FSA playing its role by employing ex-bankers that employ light touch regulation so as the government can achieve it's objective of continuing its money / debt printing ponzi scheme of an ever increasing debt mountain whilst politicians lie that they are paying down public debt as coalition government representatives have repeatedly been caught stating several times during the past 2 years despite the fact that NO debt has been repaid or ever will be repaid as total debt continues to grow exponentially. Britain's public debt trajectory remains as last analysed over 2 years ago in June 2010 (UK ConLib Government to Use INFLATION Stealth Tax to Erode Value of Public Debt ) with the Coalition government despite its rhetoric and as expected having made very little difference against what would have taken place under a Labour government, which is for a 50% increase in public debt from 2009-2010 by 2013-14 as illustrated by the ONS reporting Public debt of £1022.5 billion as of March 2012, against a Labour Government target £1078 billion by the same date as illustrated by the below graph. Off course public debt is merely the tip of the total debt and liabilities ice-berg that extents to at least 500% of GDP or over £10 trillion. The only reason why the bond market has not gone up in smoke is because ALL governments are engaged in the same smoke and mirrors game of hiding debt and liabilities off balance sheet. The price paid for this continuous money / debt printing ponzi confidence game is INFLATION. The following graph illustrates the actual EXPOENTIAL INFLATION MEGA-TREND that the people of Britain are exposed to which Government propaganda tries it's hardest to mask from the public by constantly focusing on just momentum that is the annual change. The above graph shows that over the past 5 years your money on the official CPI measure has been eroded by Inflation to the tune of 17.2%!, This IS the reason why your real experience of day to day living expenses does not match government / BBC propaganda. However it is even worse because as I keep mentioning the rate of Inflation is EXPONENTIAL. What this means is that if you stuffed money under your mattress 20 years ago, today it would have been inflated away by 52.5% CPI and on the more recognised measure RPI of 74%, to be worth approaching half its original value. The debt / money printing induced inflation mega-trend is forcing you to either spend or put money into a bankrupt banks for a pittance in interest that is TAXED, so that it is near impossible to consistently get a return that is greater than even the official rate of inflation let alone the real rate of inflation that is currently about 4%, as governments continuous tinkering with the methodology to reduce the official inflate rates as you experience when you go to do you weekly shops that usually stands about 1-2% above official CPI. The bottom line is that QE / Money Printing is a PANIC measure, therefore the UK has been in a state of economic panic for over 3 years now. The mainstream press does not understand QE, does not understand Money Printing because they rarely mention its consequences, when people hear QE, or money printing they need to think INFLATION, QE is really a policy for Quantitative Inflation which risks igniting the wage price spiral towards an hyperinflationary panic event, the longer money printing goes on the greater the risk of hyperinflation becomes. The reason why we have not had even higher inflation or even hyperinflation despite 3 years of money printing is because the QE to date has been targeted at preventing the banks from going bankrupt rather than to boost the economy, because they cannot do both, if they did you would get very high inflation. The Bank of England DOES NOT WANT THE BANKS TO LEND MORE MONEY ! Which is why they are NOT lending but holding onto the money. Because if they did start lending inflation would soar, after all it is already at 3% whilst the UK ins in a recession, at a time when the banks are NOT lending. Instead the Bank of England / Government wants the bankrupt banks to generate tax payer funded profits so that they can write down there debts. This means that virtually EVERYTHING you hear in the mainstream press about the Politicians and the Bank of England's trying and failing to get the banks to lend more is basically a lie. They want the banks to use the QE money to make profits to write down debts and NOT to lend it out in the general economy because of the fear of Inflation, this is illustrated by the fact that as soon as Inflation recently dipped back below 3% the Bank of England announced that it would pump another £50 billion into the banks, which is on top of the £140 billion non QE programme announced in mid June. However the problem is that the system is unstable, and the more money the Bank of England prints and pumps into the banks the greater the risk is of the system either imploding (deflation) or exploding wage-price inflation. 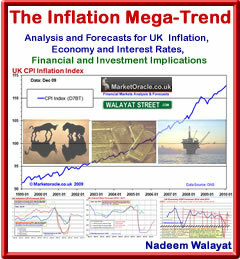 However, in my opinion probability greatly favours wage-price Inflation as evidenced by the already underway exponential inflation mega-trend that continues to erode the real-terms value of sterling whilst most academic economists and press commentators focus on the exchange rate as a sign of stability whilst missing the point that all currencies are in a state of perpetual free-fall and that all that the exchange rate shows is the volatility in the rate of decent. 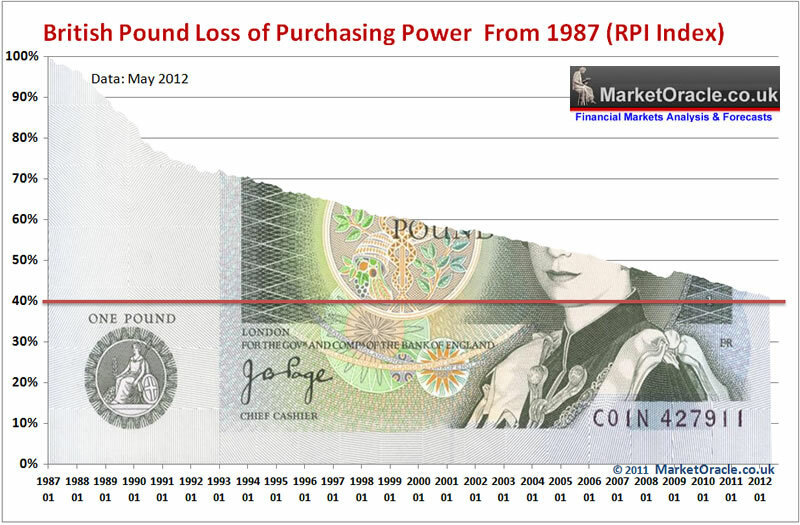 The steady theft of purchasing power of sterling on the RPI inflation measure shows that over the past 25 years 60% of the purchasing power of sterling has been stolen and funneled to those that control the printing of money, namely the banking elite. My June 2010 forecast was for Public Debt under a ConLib government to have risen to £1242 billion by March 2014, however with the current debt trajectory of £130 billion per year, this suggests that the Con-Lib government will fail to keep below this forecast and are even likely to break above Labour's higher expectation for £1262bn which illustrates that Coalition Government's just do not work. Nothing good comes out of weak coalition governments, it's as though Britain has been adrift for the past 2 years without a government as the Coalition backtracks on virtually every significant decision every other week. Therefore it would be far better for Britain if the Coalition government collapsed and for a general election to take place and a new government elected, as either a Labour or Conservative Majority government would be better than today's coalition monstrosity that is unable to deal with any of the serious issues the country faces. Thank you for the articles on this. They are appreciated. 2. Please would you comment on what you think commodities will do in the coming months. All this inflation should be lifting metal prices and commodity stocks but it hasn't to date - quite the opposite in fact. Is the trend down for a long period of time? If not, why do they keep falling, despite central bank printing recently? Will the US do a QE3? Is the stock market likely to break new highs this year? Thank you. 3. Lastly, some press releases indicated Bank of England base rates are likely to remain low for a number of years or even fall to 0.25%. Do you agree with this, and if not, how soon do you think base rates will go up and to what extent? I ask this because many UK mortgages are linked to Bank of England base rates. 4. What is you take on the UK housing market in the short term and then the long term? Do you think in general we are in for stagnant real terms prices for at least a decade? 5. Do you think there are other countries better suited to parking one's money/capital, or even buying property. I am not a homeowner. Do you think it would be wise to buy a property now (10-15% deposit)? My window would be around six months. Having always avoided any kind of debt, the thought of an interest rate spike terrifies me! I'll take a look at UK property in depth, from various angles over the coming weeks. Though the series I wrote a couple of years ago is still valid, that we have passed out of the depression phase and should be bottoming towards an uptrend. Old analysis does not necessarily mean its less valuable because if it stands the test of time that means I should avoid second guessing it. The base rate is detached from the mortgage market. It looks like it will take a panic shift to dislodge the base rate. My opinion is that UK property exposure is good for a number of reasons that I again refer to the series of articles in Mid to late 2010. I will seek to update these articles to extrapolate a more precise trend going forward for the next few years. Jas, I can't say that you should buy a property with 85% to 90% debt because I am anti-debt. 12 Jul 12, 23:57 wage-price Inflation? "However, in my opinion probability greatly favours wage-price Inflation"? I'm in the USA, so I can't speak for the UK, but here there are multiple people for every open job...i can't imagine how we'll get wage inflation? I'm actually witnessing the opposite...wage deflation...mainly through companies firing those high paid 40+ aged people and replacing them with younger hires at half the wages..
Price inflation...oh yes, I can see that...the Midwest of the USA is our grain belt...very hot and dry this year..crops are suffering..the world is going to pay a lot more for food if we don't rain and a lot of it in short order. You talk of 17.5% inflation due to money printing and say it will continue but then say housing is OK. If houses don't appreciate by more than inflation you would be buying an illiquid depreciating asset denominated in sterling. In a country under the thumb of corrupt politicians. It seems like forcing yourself to pick a bad apple out of a tub of rotting apples. Surely there must be something better? Which currencies do you think are the most stable and likely to appreciate against sterling? I am not saying we have wage price spiral now, because we don't, I am sayign that we will have it in the future. Look at present the politicial systems of countries such as the UK and US are relatively stable, when the populations start rioting in the streets Greece style cos they cannot afford to buy food, then the politicians will relent and print money to ignite the wage price spirals. I am looking at the future. The future trend is that probability favours UK house prices outperforming inflation over the next 10 years as all of the reasons I stated in articles during the second half of 2010 are starting to come into play. Yes at present it would be seen as best of a bad apple, but the fundemental fact is that there is a shortgage of property in the UK which they cannot print. [yes trillion] in collateral against $700 trillion in pending and failed real estate derivatives. What do you suppose will occur when that bubble bursts? History gives the answer - they will print money exponentially, rather than the bubble bursting, the $700 trillion would go the way of zimbabwe trillion dollar notes. Excellent work! whats your outlook on european equities in particular the PIIGS. Perhaps a buying opportunity if we begin to price in reflation? The best time to buy an asset is when it is hated, thats what I do, I did it with stocks feb- June2009 and have been doing it with UK property earlier this year. Would high wage inflation be required to support increases in the UK house values? It would be interesting to know how you expect this to happen - I know the government prints money exponentially, but I am unclear as to how this money makes its way into housing except via mortgages. It is not one thing on its own but the system as a whole. I'll explain it in a series of articles starting with an update of those I wrote 2 years ago. Is it safe to assume that UK Agricultural land will rise at least directly in line with inflation if not more and could even surpass the rise in house prices that you predict. I want your opinion on this as I have my eye on some UK agricultural land. I had contemplated buying a UK farm but concluded that it would bee too much of an unproductive use of my time. I don't know about the specifics of agricutlural land enough to say if it will out perform properties or not.